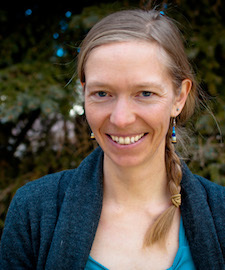 Emilene is the founding editor of Western Confluence magazine, a biannual publication from the Ruckelshaus Institute covering collaborative approaches to natural resource problem solving in the West. She oversees production of each issue, edits stories, writes articles, and distributes the publication. She also works as communications coordinator in the Haub School, overseeing web and print materials including newsletters, reports, press releases, social media, and web content. Emilene's primary professional interests are in long-form narrative journalism and writing about environmental and natural resource challenges in the western US. To that end, she occasionally contributes writing to relevant publications. Currently she is editing text for the Atlas of Wildlife Migrations: Wyoming's Ungulates, forthcoming from Oregon State University Press in 2018. She also published an essay in Yellowstone Migrations, a book of Joe Riis's photographs from Braided River, in 2017. Previously, Emilene was photographic coordinator at National Geographic magazine in Washington, DC, a reporter at High Country News in Colorado, and a freelance reporter covering environmental and community stories in the West. Her graduate thesis was a collaborative project with wildlife photographer (and ENR graduate) Joe Riis to document, through photography and storytelling, the migration of a herd of pronghorn antelope from its summer range in Grand Teton National Park to winter range in the Green River Basin and back. Her High Country News cover story about the project won the 2012 Science in Society Journalism Award from the National Association of Science Writers and the 2012 Knight-Risser Prize for Western Environmental Journalism from Stanford University. She has lived abroad in Guatemala and Mexico.